I met Jess through YouTube. Actually, I met her in the aisles of our local Target the day after Christmas. I woke up early and Hannah and I went to peruse the half priced decorations when Jessica introduced herself. That was the last time I went to Target without makeup on. 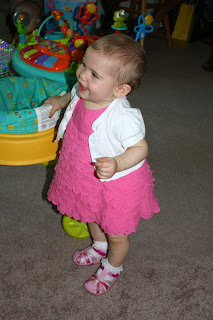 Last Saturday was Ethan's first birthday party so Hannah donned her party dress and pretty shoes and away we went! Jessica picked a monkey theme for the party and it was super cute. Just look at these cupcakes! She said she got the cake topper from Etsy. I love that website - it has everything I never knew I needed. Ethan received lots of presents - mainly opened by his father, Aaron. 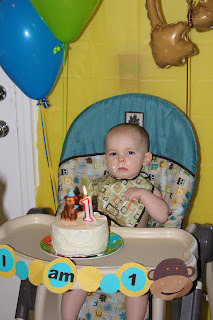 But he LOVED the frosting. 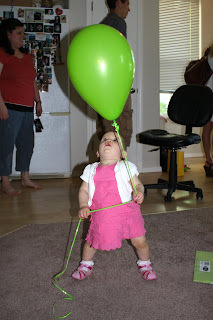 At the party I realized that Hannah had never seen a balloon before. 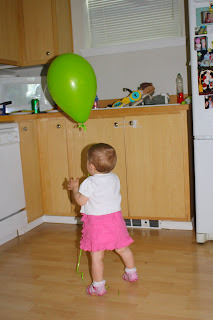 She didn't quite know what to make of the floating toy, and it was so neat to watch her figure it all out. Happy Birthday Ethan! Thanks for inviting us to your party. We had a great time! 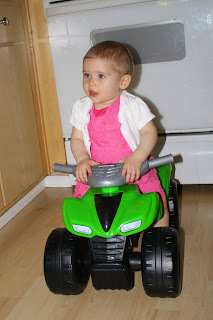 hmm...me thinks that grandpa will find her a pink ride-on toy! Awe:) Hannah Is soo Cute! I love it! I didn't see her climb on and off the quad. That's awesome! I think she could rock the green color or maybe Daddy could paint it. btw since I rarely wear makeup, I didn't even notice, haha. Yay! I'm so excited you have a blog! I wrote you a few months ago when I started mine and you had mentioned hoping to start one! I'm excited to have an awesome new blog to follow! 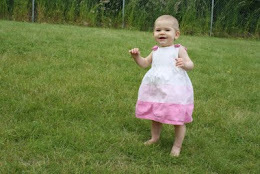 Hannah is adorable and getting so big! Those cupcakes are too cute! Looks like she had fun at the party! She's growing up so fast! I love having another Carla blog to follow :) Not that I don't love watching your videos but blogs are fun too.